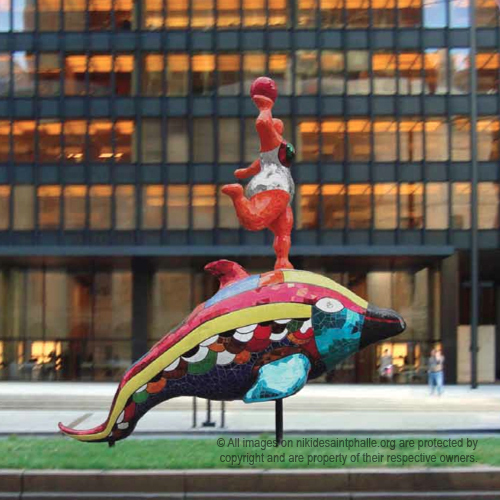 Nohra Haime Gallery will present Niki de Saint Phalle on Park Avenue from 12 July  15 November 2012. This major public exhibit  which will be on display on Park Avenue between 52nd and 60th Streets in New York City  will include nine monumental sculptures and feature Saint Phalle’s signature nanas and totems, as well as works from her iconic Black Heroes Series depicting legendary jazz musicians and athletes. Learn more. The nine monumental sculptures will be on display on Park Avenue between 52nd and 60th Streets in New York City from 12 July to 15 November 2012. The show will kick off with an event at Nohra Haime Gallery (730 Fifth Avenue) on Thursday 12 July from 6:00-8:00 pm. A variety of programs ranging from tours to lectures also are being planned in conjunction with the exhibition. Learn more. “Explosion explores the rich and complex cross fertilizations and borderlands of painting, performance and conceptual art. It traces this expanded idea of painting as action from late 1940s until today. The exhibition will include works in different media by some 45 artists from many parts of the world  such as the important Japanese Gutai group, including Shozo Shimamoto, Sadamasa Motonaga, Saburo Murakami and Kazuo Shiraga, along with such artists as Allan Kaprow, Jackson Pollock, Niki de Saint Phalle, Yves Klein, Ana Mendieta, Alison Knowles, Rivane Neuenschwander, Yoko Ono and Lawrence Weiner. “EXPLOSION! Painting as Action” will be on display from 2 June to 9 September 2012 at the Moderna Museet in Stockholm. The museum is open to the public Tuesday from 10h-20h and Wednesday-Sunday from 10h-18h and is closed Monday. Admission is 100/80 SEK for adults and free for those 18 and under. © Photo: Åsa Lundén/Moderna Museet. 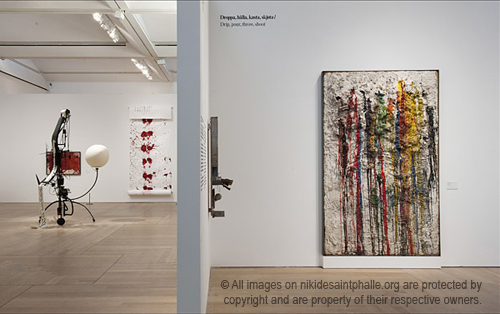 Works (from left): Jean Tinguely, Méta-Matic no 17, 1961 © Jean Tinguely/BUS 2012; Kazuo Shiraga, Untitled, 1956-2006 © Kazuo Shiraga; Niki de Saint Phalle, Tableau tir, 1961 © Niki de Saint Phalle/BUS 2012.